The next meeting of the Society takes place on Thursday 12th November 2009 at 7:30 pm in St. Andrew’s Church, Bilston Street, Sedgley. Founder members will be reminiscing about the Society's early days and the local history museum that operated for sixteen years. Trevor Genge’s books and Ron Baker’s sketches will certainly be conversation pieces. Also some memorabilia and a short video of the museum’s last days should bring memories flooding back. In its heyday the buildings on this site provided a vital service to the community, but where is it ... and what was the service? This was the site of Lower Gornal gasworks east of Musk Lane and entered from the long gone Gas Street! The District Gas Company Works, a Victorian enterprise, was acquired by Sedgley Urban District Council in 1882, and through the 1948 Gas Act the undertaking transferred to the West Midlands Gas Board. Production continued through the 50s and possibly early 60s. 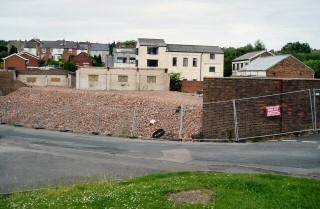 Prior to final demolition in 2008/9 a collection of redundant buildings was utilised as a small industrial estate. The Society does not have a decommissioning date or photographs of the gasworks. If you can further our research please send an email.